Damian Cote is an artist working in a broad range of mediums. His research interests include the topics of military life, war, social interaction, and human shortcomings. He works primarily in printmaking and drawing in addition to digital media and painting. 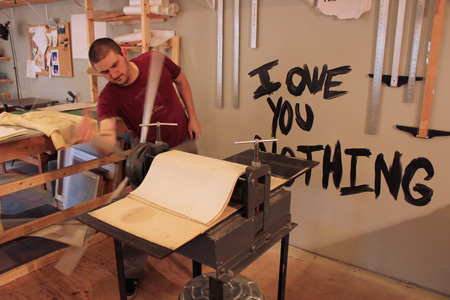 His artwork has been exhibited at the IPCNY, College of Notre Dame, Philagrafika, and the Boston Printmakers North American Biennial. He has lived and worked in Okinawa, Japan, South Korea, Guantanamo Bay, Cuba, and currently lives in Holyoke, Massachusetts.